Born in Zurich in 1967, Liliane Tomasko is known for her quietly powerful, richly evocative works. With a focus on the domestic sphere, the artist – who originally trained as a sculptor at London’s prestigious Royal Academy of Arts – has a unique working method: she creates soft sculptures from fabrics stacked in dimly-lit interior spaces. Tomasko then photographs the resulting agglomerations with a flash-less Polaroid camera, producing images that are intentionally distorted. These semi-abstract photographic forms – phantoms of sorts – inspire the undulating masses of light and color that the artist paints so skillfully in oil on linen. 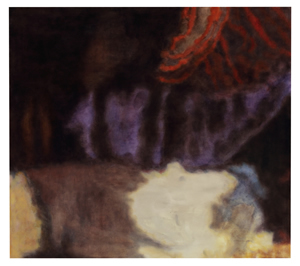 The resulting works are visually lush, and leave no doubt about Tomasko’s abiding interest in the work of the Post-Impressionist painters Pierre Bonnard and Édouard Vuilllard. Her work equally evokes of the quietude of Danish painter Vilhelm Hammershøi, as well as the carefully contrived, almost architectonic, severity of Barouqe masters Georges de La Tour and Johannes Vermeer (a severity that Tomasko intentionally fractures). Drawn to subjects that speak to the human condition, the artist arouses in the viewer a sense of discomfort that comes from being gently nudged toward the thin line that separates love from loss, liberation from constriction, presence from absence, and ultimately, life from death. Tomasko’s forms, like her palette, a tense balance between stasis and chaos, with suggestive realities that seem, magically, to ebb and flow across her canvas.